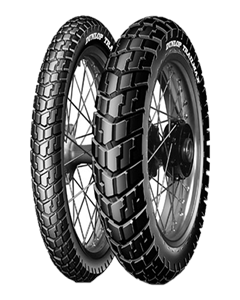 The Trailmax is another Dunlop ‘Original’ and can be found on a wide variety of large capacity Japanese and European off road motorcycles. Most of these models carry the Trailmax as Original Equipment (OE) when they leave the factory. The reason for this OE success is simple; the Trailmax more than reflects the requirements of the majority of on/off riders with a slight bias towards on road riding capabilities, but giving a solid performance in moderate off road conditions as well. The Trailmax uses a durable nylon-ply construction for total riding confidence on any surface. With its large contact patch, directional semi-lug and multiple-edge it doesn’t shy away from the rockiest terrain. An extensive fitment list covers a variety of 19" and 21" front, and 17" and 18" rear tyre sizes.